Bringing together over 60 local artists, Middleton Outreach Ministry (MOM) hosted its third annual “Creating for a Cause” art fair earlier this month. MOM is dedicated to preventing hunger and ending homelessness. In keeping with this goal, its annual art fair is held at its food pantry on Parmenter Street in Middleton. At least 20% of the fair’s proceeds—garnered from items like colored pencil portraits, fused and stained glasswork, and ceramic pottery—benefit the community. This year, Simpson Street Free Press student reporters enjoyed attending the fair and speaking with its coordinators and artists. According to MOM Special Events Coordinator Elaine Bogen, most of the participating artists choose to give 100 percent of their earnings from the fair back to the community. Many also gave generous personal donations. Jan Fulwiler, MOM volunteer and a “Creating for a Cause” coordinator, indicated that the annual art fair is one of Madison’s most successful. Artists come back year after year to participate in the fair. In fact, over 10 artists were actually turned away from this year’s fair, Fulwiler said. 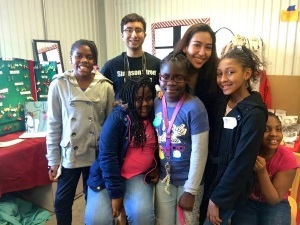 Simpson Street reporters had a great time getting to know these young artists who enjoy making a difference in the community in a special way. We are proud of the fair’s success and can’t wait to go back next year!